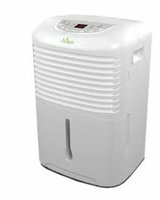 The Alen MDF3-70 Dehumidifier is a new model and one of the best portable dehumidifiers sold in the USA. Although "new" the Alen MDF3-70 is virtually identical to the model it replaces, the MDF3-74. The only difference is that the nominal water extraction rate of the MDF3-70 is listed as 70 rather than 74 pints per day. For this reason I am able to recommend the Alen MDF-70 to our visitors without reservation. The Alen MDF3-70 Dehumidifier is a high capacity portable unit suitable for a basement or other large area of up to 1200 square feet. The MDF3-70 is Energy Star® qualified with an Energy Factor of 1.8ltr/kwh and a typical power consumption of 800 watts per hour. The MDF3-70 is available at around $240, a price similar to other portable models of comparable power. The unit is well featured and meets most of the usual requirements but lacks a timer switch which may make it unsuitable for some users. Alen is a US company but this model is not made in the USA but is manufactured in China on behalf of the Alen Corporation. Reviews by consumers confirm that the Alen MDF3-70 Dehumidifier is effective in a basement which is where most of these units are used. Users comment positively about the build quality of this unit and their experiences suggest that the Alen model compares well with many other brands for reliability and longevity. A significant number of reviewers complain about the noise level from the Alen, a common complaint about all high capacity models. Continuous drainage works well for most users. Since the Alen MDF3-70 Dehumidifier is virtually identical to its predecessor I have no difficulty in recommending it to our visitors. My only reservation about the earlier model was its relatively high price but since the MDF3-70 is now offered at a similar price to the other brands I recommend this reservation no longer applies. To see my other recommendations please take a look at this page.